Thanks for the Idea. 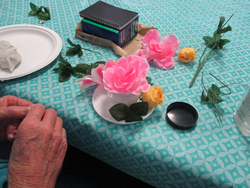 We have a seniors week high tea coming up and we actually got our social group to create some centrepieces themselves, they look lovely. They look beautiful Karen! Thank you for sharing a photo! I did this, but we planted succulents in the cups. What a great activity, I'm going to start organise this for a craft sessions. just made this with my residents and they loved it,had lots of fun! Hi everyone i have done a beautiful high tea party for Mothers day with flowers in tea cups also empty small jars and have the residents decorate them with coloured strings or ribbon even with paper cup cake .Also pom poms hanging from the ceiling and garden areas. we also used this idea and placed a piece of foam inside the cup wrapped in any decorative fabric to make a pin cushion. Then used any decorations such as beads, flowers, ribbions on the outside of the cup and saucer simply by using glue.